Will maths kill the rhino? One of the distressing aspects of the modern world is the large number of animal species in danger of extinction. The authoritative guide to this depressing reality is the Red List, maintained by the International Union for Conservation of Nature. Through a careful and extensive process of evaluation, the IUCN categorises highly endangered species as Vulnerable, Endangered or Critically Endangered. For example, the lion is listed as vulnerable, the tiger as endangered, and the Sumatran rhino as critically endangered. Recently, a team of ecologists at the University of Adelaide and James Cook University introduced the SAFE index, a new measure of the threat of extinction. They have suggested that the SAFE index might be used in conjunction with, or even replace, the Red List categories. Their paper has appeared online in the journal Frontiers in Ecology and the Environment. Professor Corey Bradshaw, a team member, has described the SAFE index as "the best predictor yet of the vulnerability of mammal species to extinction". The SAFE index has received extensive and very favourable coverage. There has been no challenge to Professor Bradshaw's claim that his team has made a "leap forward" in measuring extinction risk. We, however, are unimpressed by the leap. The SAFE index assigns a number to each species. For example, the lion, tiger and Sumatran rhino have SAFE indices of 0.52, -0.21 and -1.36, respectively. Lower numbers, particularly negative numbers, are intended to indicate a greater danger of extinction. What's behind these numbers? In a nutshell, the "leap forward" is the notion that the fewer animals in a species then the less likely the species will survive. That's it. It's a reasonable idea, at least as a general rule of thumb, though it's hardly rocket science. True, the SAFE index involves extra calculation. It is estimated that the "minimal viable population" for mammal species is 5000. Then, the population numbers are logarithmically scaled, so that a species population of 5000 has a SAFE index of 0. However, we can see no value in this mathematical juggling. The SAFE index contains no more information than the population number of a species, and it is obviously less transparent. Still, the important question is how the SAFE index (or equivalently, the population number) compares in usefulness to the Red List. The Frontiers paper implies that the SAFE index is more objective, and is superior by being a quantifiable measure. We are sceptical on both counts. The focus of the Frontiers paper is measuring the agreement of the SAFE index with numerical versions of the Red List. 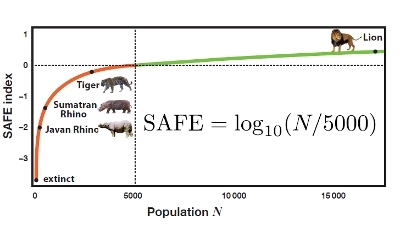 In fact, the Red List itself is the only benchmark of the SAFE index that is indicated: no direct evidence is provided of the ability of the SAFE index to predict survival or extinction. However, it is impossible to argue that the SAFE index is more reliable, or less subjective, than the standard by which it has been measured. As such, we are aware of no evidence that the SAFE index is superior to the Red List. In fact, we believe that it is inferior, that the SAFE index introduces unwarranted quantification, which is at best distracting and at worst actively misleading. Consider the Frontier paper's discussion of the Sumatran and Javan rhinos, both critically endangered species. 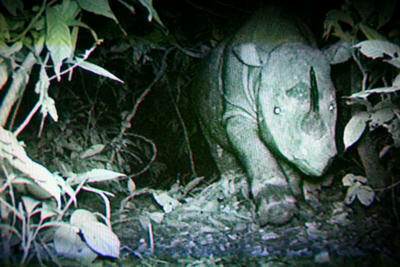 The Javan rhino has a SAFE index of -2.10, lower than the Sumatran rhino's -1.36. On this basis, it is suggested that conservationists may wish to give up on the Javan rhino, to concentrate their efforts upon the Sumatran rhino. That may be a wise, if tragic, decision. However, it should not be forgotten that what is being discussed here is a total of about 50 Javan rhinos and 250 Sumatran rhinos. It takes no deep thought or logarithmic computation to determine that both species are in dire trouble. Furthermore, for such tiny populations, the precise population numbers lose much of their meaning. Whatever small chances there are of saving either species of rhino will depend critically upon very local and very specific information, none of which is taken into account by the SAFE index. Indeed, it is difficult to see what the SAFE index contributes here, other than obfuscation.